This dish is a quintessential British summer on a plate, not that it has arrived yet! It’s actually two desserts in one so feel free to steal whichever one appeals to you more. The treacle tart is something I’ve been meaning to make for years. While making it I was thinking I don’t even know what treacle is as there isn’t any in the recipe. After a little research, treacle, is any uncrystallised sugar syrup, hence the golden syrup used in this dish. I suppose golden syrup tart doesn’t quite have the same ring to it. If eating it cold, I would serve it as above. It is at its best warmed in the microwave and served with cream. I used an interesting shortcrust pastry for this dish. It was equal quantities of flour to butter. This made it very tricky to handle but results in a delicious buttery biscuit base. The ice cream came about from the great Haagen Das flavours we can get these days. After a little research I realised the key to a “cheesecake” ice cream is to use some cream cheese in the recipe. Simples. Begin the ice cream. Cook 200g strawberries with 100g sugar for 15 minutes until you have a pulpy mix. Set aside to cool and stiffen. Add the cream, cream cheese, sugar and vanilla to a pan bring to the boil. Mix the eggs with the cornflour, tip the cream into these and put all back into the pan. Heat until it begins to thicken. Remove, cool with a layer of cling film on top of the mix. Once cooled add to an ice cream machine. Once churned add the reserved strawberry jam(pulp) and the digestives. Place in the freezer until needed. For the tart. Butter and line a 23cm/9in tart tin. Rub the butter into the flour with the salt and sugar until it resembles breadcrumbs. Add the egg and lemon zest, bring together in a soft ball. Roll out to a large disk. Place in the fridge to harden. Once hardened, line the tart tin and cook at 150°c for 30 minutes. Lined with baking beans. Mix together all the remaining ingredients. The golden syrup is easier to work with if you warm it a little. Pour into the pastry case and bake at 150°c again for 60 minutes. It is cooked once there is no longer any wobble in the mix and you have a crumble looking top. Serve as recommended or blitz some strawberries with a little icing sugar to make a coulis as above. I’ve never eaten a treacle tart before but now that I have your recipe I’m going to make one. I did buy a tin of treacle recently and I needed one teaspoon of it. I’m good to give this a go. It looks yummy. My heart jumped for joy when I saw your post! I adore treacle tart and is the absolute child hood memory evoking dessert! My school kitchen used to serve this but they used crushed corn flakes. I love this stuff and have made it before. I’d make it often if the golden syrup didn’t cost an arm and a leg her! I love your tart and your ice cream is perfect too! Hope you’re well and not too busy. Still flying to Las Vegas? Stop by Denver! Hi Nazneen, i’m just starting to do back to back long haul now. I’m going to Orlando next week, we stay at the Florida Mall so I’ll make some enquiries about posting things when i’m there. Golden syrup in the states must be like maple syrup over here. It’s either £6 a bottle (250ml) or maple “flavour” syrup. Hi David, One of the things I enjoy from bloggers in other parts of the world is all the new things I learn. I have heard of treacle but had no idea what it was. One of these days I’m going to have to give in and buy an ice cream maker…your cheese cake flavor sounds very good. It’s a very forgiving ice cream, Karen. It’ll work very well by freezing for an hour, stir with fork, freeze again. Four times. Definitely one of those desserts sweet enough to make your teeth ache, but so tasty too. I love the use of zest both in the filling and the pastry. The ice cream sounds fabulous. I hope I do not need to pick one or the other as they both look like the perfect compliment to one another. I have had treacle tart before but yours looks so perfectly golden brown and delicious. Have a super day! David, your blog is terrific – thank you for dropping by mine, so now I get a chance to get to know your blog. 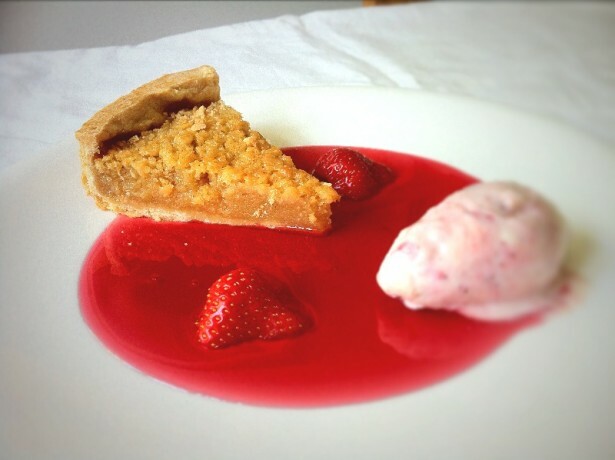 Your two recipes are just wonderful – we can get golden syrup around here and I would love to give your recipe a try as I have looked at many treacle tart recipes before but never had a chance to bake one. But I also love the strawberry-cheesecake ice cream – there are so many strawberries available right now, perfect time to give your recipe a try! Thanks again for stopping by my blog – I am also looking forward to my upcoming visits! What a beautiful and artisctic photo! Hi Michal, thanks for stopping by. Hope you enjoy the blog. Join me in trying to recreate restaurant quality food at home. Staying in, is the new going out!